We were pleasantly surprised the other day when one of our users announced that he had used our REST API to build a very nice third-party Pingdom app for Windows Phone 7. It’s called Pingdom Pulse. The guy behind the WP7 app is Will Johnson, a developer from the UK. The app is free, looks good and runs well, so if you have a Pingdom account and a WP7 phone, check it out. It works with both free and paid Pingdom accounts. The current version of Pingdom Pulse lets you view the status of your monitored sites and server, look at your monitoring settings, and perform additional tests on any website. Above: Pingdom Pulse for Windows Phone 7. Naturally we were curious about Will’s experience developing an app on top of our platform. Pingdom: Tell us a little bit about yourself. Will: I’m a web developer currently working for a digital agency in the UK. 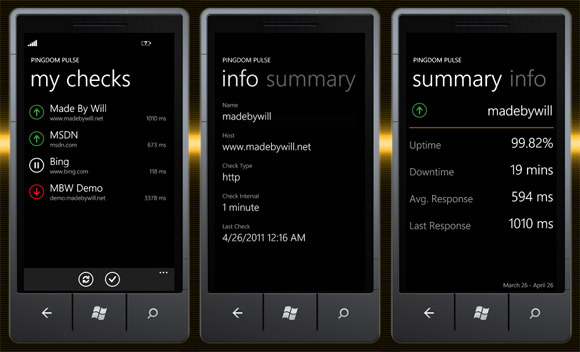 I started developing mobile apps with the launch of Windows Phone 7 and Pingdom Pulse is my second app. Pingdom: How long have you been using Pingdom? Will: I’m fairly new to Pingdom, we started using it at work about a year ago and I started monitoring my own personal hosting with a free account about 6 months ago. I’ve found it really useful both at work to alert us when something is wrong and for my own site where I’d noticed some slow response times. Pingdom: What made you decide to develop a Pingdom WP7 app? Will: I was looking for my next WP7 project in March when I got your email about the new REST API. I’d previously played with the iPhone app and thought it was a perfect project. It ties in to a bigger project I’m hoping to build in the future, so it was great to be able to try out the API and produce something useful so quickly. Pingdom: How did you like working with the Pingdom REST API? Will: It was really good, a well thought out API that covers a lot of functionality (I’ve only scratched the surface so far) and really good documentation. Having worked with a lot of API’s over the last year or two it’s great to have documentation like this! Pingdom: Any gotchas you’d like to share with other developers using the Pingdom API? Will: I don’t think I’ve come across anything yet, everything has just worked as expected. Big thanks to Will for taking the time to talk to us. We have to say that we’re very happy to see these kinds of efforts. We’ve put a lot of effort into making a useful, flexible API for the Pingdom uptime monitoring service which is part of our digital experience monitoring offering. To see other developers putting it to use and building on top of it is very gratifying.